scoring ring, then give it the higher value. When scoring any target, insert the plug carefully and through the center of the shot hole. Do not disturb unnecessarily the paper around the edge of the shot hole being plugged. Do not attempt to guide the gauge in any direction - let it seek its own direction. Targets are best scored while the target is in a horizontal position with the plug gauge standing vertical and free without being touched by the fingers. This allows the spindle to follow the same path as the bullet and the flange will indicate the true value. Unless your using an outward smallbore gauge, the view of the gauge should be directly from above the spot viewed, not a side view. A side view will frequently distort the picture, and inaccurate scoring will result. High power rifle targets are usually scored in the pit. Even though competitors may operate the pit and score, it is an excellent plan to hold a short practice session prior to the take-over by each group in the first match. The Chief Pit Officer can, in five minutes, explain to each group how they should score shot values and any other procedures he wishes to be followed. 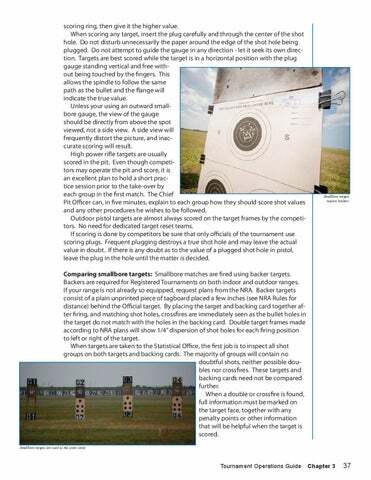 Outdoor pistol targets are almost always scored on the target frames by the competitors. No need for dedicated target reset teams. If scoring is done by competitors be sure that only officials of the tournament use scoring plugs. Frequent plugging destroys a true shot hole and may leave the actual value in doubt. 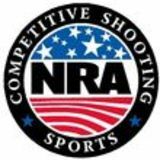 If there is any doubt as to the value of a plugged shot hole in pistol, leave the plug in the hole until the matter is decided.